My bathroom sink is draining with the sink stopper engaged – Could it be a bad seal, bent rod, loose part? – How to fix a slow draining sink stopper… Sometimes, a poorly-performing sink drain can’t be fixed with only drain cleaner or a pipe snake. One of the most common causes of bathroom sink trouble is a problem with the sink stopper. What is a sink stopper and is it easy to fix? A stopper is a small ball and rod assembly found just under the sink drain; this component controls the seal of your drain, and is usually the first place to check if you’re encountering slow draining or a poor seal when you engage the drain stopper. Thankfully, it’s also an easy mechanism to troubleshoot. Manual maintenance of your sink is also far better for the environment, and your family’s health, than reliance on caustic drain cleaning products. Below, we’ll give a quick step-by-step rundown that will help even the novice DIY-er avoid an expensive call to a professional plumber. The pivot rod extends horizontally out the back of the drainpipe under the sink, and connects via a small spring clip to the vertical lift rod that lies on top of the faucet assembly (this is the little mechanism you push or pull to engage or disengage the drain stopper). Often, these thin metal rods can loosen with repeated use; if your lift rod is not fully sealing the sink drain, first ensure the rods are assembled tightly. Rods can be bent, shortened, or re-angled to ensure the lift rod is fully engaging the sink stopper. 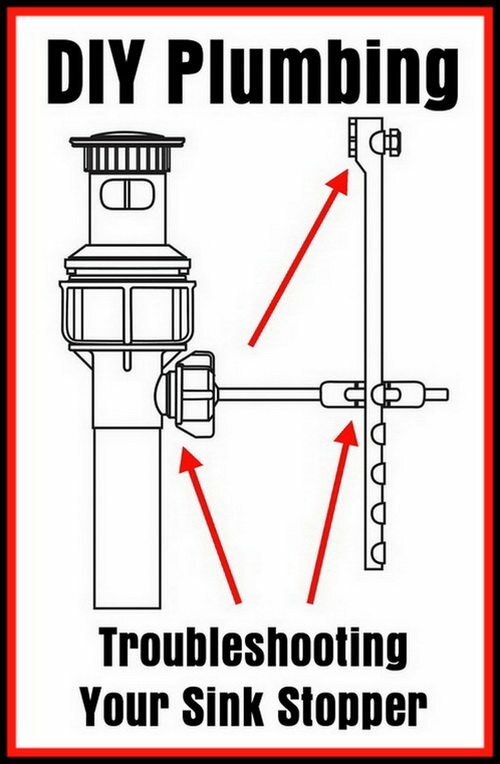 If the lift rod fails to engage the stopper at all, the rods have likely disconnected, and are easy to re-secure. If the pivot rods are fine, the next place to check may require some disassembly. The part of the pivot rod held inside the drain is usually a small plastic ball that connects to the stopper; when the pivot rod is levered up or down, this ball lifts or seats the drain stopper accordingly. Often, the ball can become disengaged from the stopper. If your drain stopper lifts right out of the sink, it has separated from the ball. Alternately, if your drain stopper is not properly attached to the ball, or a buildup of hair, gunk, or debris in the drain stem is impacting the stopper’s movement, the stopper can often sit too low in the drain, meaning slow draining and buildup of gunk in the bowl of the sink. With newer sinks, simply detaching the pivot rod and spring clip from the lift rod and re-securing it higher on the lift rod will usually do the trick. If not, you likely have an issue inside the drain stem, and will need to do a little disassembly. First, you’ll need to get under the sink. Gently loosen the large plastic retaining nut securing the drain stem to the sink bottom counterclockwise to remove the stem. Depending on your drain setup, you may also need to loosen the nut securing the bottom of the stem to your drain trap. If so, it may be a good idea to cover the exposed trap with a plastic bag or tape to avoid any potential sewer gases from entering your home. Depending on how old the stem is, the nut may be a bit difficult to remove. Be careful with the retaining nut; while the use of locking pliers, lubricant, and/or a wrench may help with tough nuts, too much force can damage the plastic nut. Slow and steady is the way to go. Once the stem is free, you can check the inside for any impacted gunk that requires removal. Once you’ve ensured the stem is clear of any debris, make sure the arm of the ball is fully seated into the hoop on the bottom of the drain stopper. Reassemble the stem back into the drain trap, and re-engage the retaining nut at the top of the stem to secure the assembly back into the sink. 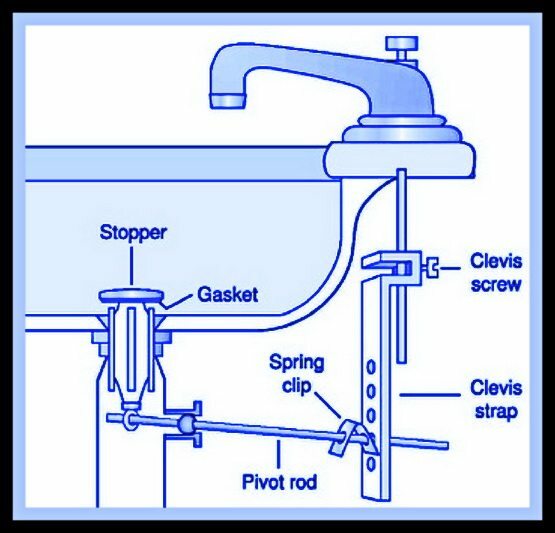 While doing this, make sure the pivot rod and lift rod are correctly secured with the spring clip, and give the lift rod on top of the faucet a few pulls to ensure the drain stopper is fully seating and rising. Note that if your drain assembly is very old, at this point it may be worth it to consider investing in a brand new drain assembly; the installation is identical, and newer assemblies are both affordable and often perform far better than repeatedly maintaining an old or poorly-maintained assembly. To finish up, run a bit of water in the sink to ensure no leaks around the assembly. If you notice any leakage around the retaining nut, gently loosen and re-secure it tightly. In some cases, you may need to apply a sealant like plumber’s putty around the nut’s threads to ensure a good seal. Once you’ve confirmed your pop-up is tightly assembled and leak-free, you will not have to worry about leaks! And there you have it, a sink draining and sealing like it was brand new! As we’ve seen above, under-sink plumbing isn’t as difficult as it would first appear. If you’d like to learn more about making sure your home’s plumbing fixtures run smoothly for years to come, visit RemoveandReplace.com in the Plumbing category. 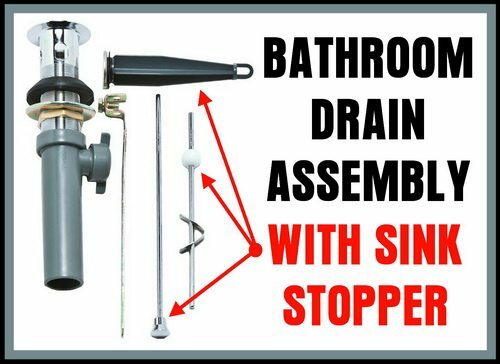 If you have comments or questions about your bathroom sink stopper, please leave a comment below and we can assist you to repair it or direct you to which parts you may need. Next post: How To Fix a BIG Hole In Your Drywall – FAST!